Is smoking killing you or a loved one? Would you like to improve your health, be free of cravings or tension, have more energy, improve your sense of taste & smell, have fresher breath, whiter teeth while removing stress or anxiety & saving tens of thousands of dollars quickly/easily? Stop Smoking Permanently will help you break the chains of and gain complete freedom from smoking for life, quickly & easily! 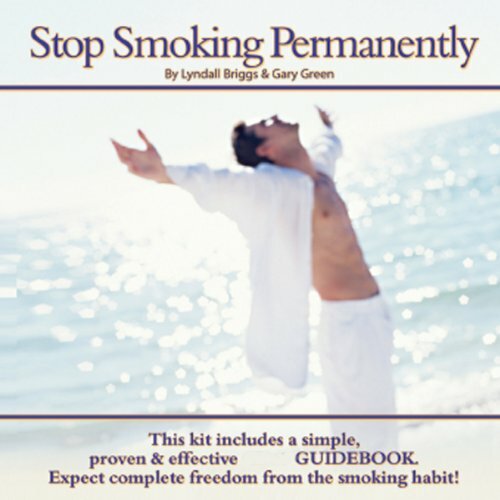 When you buy Stop Smoking Permanently, which includes the Stop Smoking Permanently self help book, you'll see, hear, feel, and experience all the great benefits of this highly effective self help program. I've reviewed all of the major stop smoking programs; not only what they offer, but whether their claims are founded in reality or just advertising hype. I was initially skeptical about Stop Smoking Permanently, despite reading several glowing reviews on the web. But to get straight to the point, IT WORKS! That's it!! I read the PDF Guidebook that came with it FREE (well written, quick and easy to read too), then listened to track 1, 2 & 4 and amazingly after that, no withdrawals, no side-effects, no weight-gain AND NO MORE SMOKING!! I will never smoke again and highly recommend this CD (Audiobook) to anyone who has ever tried to quit but failed. It's like having a hypnotherapy session in a can, but only more powerful, relaxing and PERMANENT (you can listen as often as you like, safety in your comfort at home)! It's almost like a switch in my brain has been thrown which has turned off my smoking addiction. Thoroughly awesome, life-changing and highly recommended to anyone who wants to quit the stinking filthy expensive habit for life! If you smoke, than BUY this audiobook; it will save your life. It's also worth noting that the Self Development range has been proven effective in research published in the Counselling, Psychotherapy and Health Journal, where respected researcher and PhD candidate Elizabeth Carter (a Register Psychologist), independently examined the products. Technology and art have been combined masterfully to produce this truly amazing program/kit! Highly recommended. I've downloaded a lot of Self Developments audiobooks and found them to work wonders! The attached reading material is excellent too... When I listen to the relaxing voices of the narrators and their soothing accompanying music, I feel totally relaxed and exhilarated. I can't recommend them highly enough!! !